The first two sections of this chapter are strictly related to some seminal Peircean philosophical considerations concerning abduction, perception, inference, and instinct which I consider are still important to current cognitive research. Peircean analysis helps us to better grasp how model-based, sentential and manipulative aspects of abduction have to be seen as intertwined. 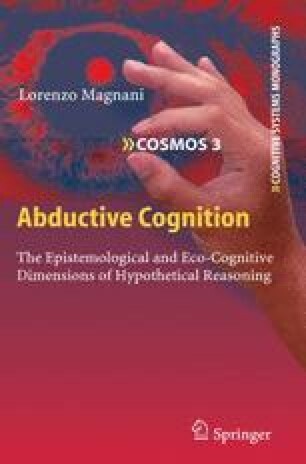 Moreover, Peircean emphasis on the role of instincts in abduction provides a perfect philosophical introduction to the problem of animal hypothetical cognition in the remaining part of the chapter. First, Peirce explains to us that perceptions are abductions, and thus that they are hypothetical and withdrawable. Moreover, given the fact that judgments in perception are fallible but indubitable abductions, we are not in any psychological condition to conceive that they are false, as they are unconscious habits of inference. Unconscious cognition legitimately enters the abductive processes (and not only in the case of some aspects of perception, as we will see). The same happens in the case of emotions, which provide a quick – even if often highly unreliable – abductive appraisal/explanation of given data, which is usually anomalous or inconsistent. Second, Peirce contends that perception is the fruit of an abductive “semiotic” activity that is inferential in itself. The philosophical reason is simple, Peirce stated that all thinking is in signs, and signs can be icons, indices, or symbols. The concept of sign includes “feeling, image, conception, and other representation”: inference is in turn a form of sign activity, that is, the word inference is not exhausted by its logical aspects and refers to the effect of various sensorial activities. Third, iconicity hybridates logicality: the sentential aspects of symbolic disciplines like logic or algebra coexist with model-based features – iconic. Sentential features like symbols and conventional rules are intertwined with the spatial configuration, like in the case of “compound conventional signs”. What I have called sentential abduction is in reality far from being strongly separated by model-based aspects: iconicity is always present in human reasoning, even if often hidden and implicit. It is from this perspective that [sentential] syllogism and [model-based] perception are seen as rigorously intertwined. Consequently, there is no sharp contrast between the idea of abduction (both creative and selective) as perception and the idea of abduction as something that pertains to logic. Both aspects are inferential in themselves and fruit of sign activity. Taking the Peircean philosophical path we return to observations made in the previous chapter: abduction is basically multimodal in that both data and hypotheses can have a full range of verbal and sensory representations, involving words, sights, images, smells, etc. but also kinesthetic and motor experiences and feelings such as pain, and thus all sensory modalities.